Where we should not expect landslides? Landslide susceptibility is the propensity of a territory to generate landslides. Many methods are available to determine landslide susceptibility, whereas only a few attempts were made to outline areas not likely to generate landslides i.e., non-susceptible landslide areas. This is surprising, because for planning purposes it is just as important (if not more important) to know where landslides are not expected than to know where landslides may occur. We have developed a simple statistical method to delineate areas not susceptible to landslides, and we applied the method in Italy and in the landmasses surrounding the Mediterranean Sea. Our method uses only two variables: local terrain slope and relative relief i.e., the maximum elevation difference in an area. We calculate both variables from a digital terrain model (DTM), a numeric representation of the terrain. 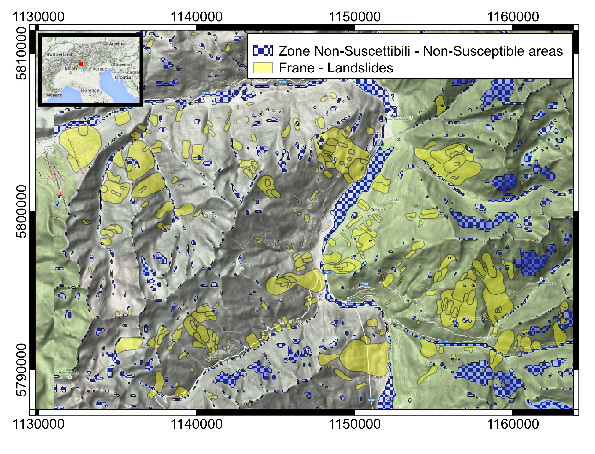 Using 13 landslide maps produced over the years by our research team in nine regions in Italy, we determined a statistical relationship between the lack of landslides ant the local slope and general relative relief. 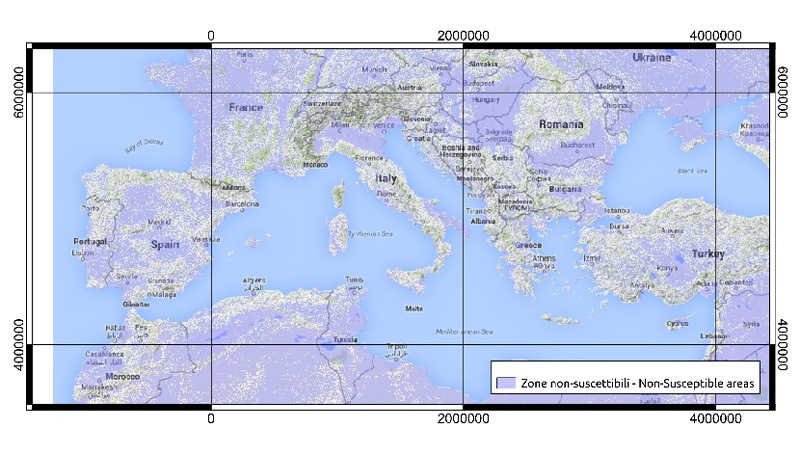 Next, we applied the relationship to the whole of Italy producing a national map showing non-susceptible areas. Later, we extended the mapping to an area of more than five million square kilometres surrounding the Mediterranean Sea. Tests bade using landslide data in two study areas in Spain have demonstrated the reliability of our non-susceptibility landslide map for the Mediterranean area. 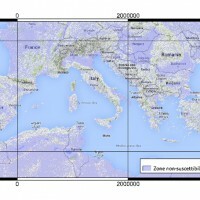 We used the map showing non-susceptible landslide areas in Italy and information on the distribution of the population provided by the National Italian Institute of Statistics (ISTAT), to identify 193,051 (50.5%) non-susceptible census zones, covering 20.2% of the national territory. We further estimated that about 33.1 million people, 57.5% of the total population, live in non-susceptible areas in Italy. The regions with the largest proportion of the population in non-susceptible areas are Emilia-Romagna (80.6%), Veneto (79.3%), Puglia (74.4%) and Lombardy (73.1%). Basilicata (86.3%), Molise (87.0%), Liguria (77.3%) and Valle d’Aosta (74.2%) are the regions with a significant proportion of the population in areas that can not be considered non-susceptible to landslides. Marchesini I, Ardizzone F, Alvioli M, Rossi M, Guzzetti F. 2014. Non-susceptible landslide areas in Italy and in the Mediterranean region. Natural Hazards and Earth System Sciences 14(8) : 2215-2231. DOI: 10.5194/nhess-14-2215-2014.